This started from my realization that the last bag of shredded chicken meat I had wasn’t enough to make anything substantial. Still, I didn’t want to go back to making the same dishes I’d already done (which would inevitably lead to eating the same dishes I’d already done. Again). Then I remembered how people sometimes wonder about what’s really in chicken nuggets. That’s it – my next chicken dish with my own mystery ingredients! Instead of wondering about what’s in chicken nuggets from fast food chains, why don’t we make them at home, with the ingredients we know? Better yet, ingredients that are actually good for you? Within a small focus group that tried my chicken nuggets (i.e., a couple of friends having dinner at my place), they couldn’t figure out what was in these ‘nuggets.’ Just the way I wanted it. There were enough chicken bites to assure them that these indeed contained chicken meat, but the combination of ‘creamy’ and ‘ricotta-like’ texture that went well together seemed puzzling to them before I disclosed my ingredient list. Combine 2 Tbsp. of honey, 2 Tbsp. of whole grain Dijon mustard and 2 tsp. of soy sauce. 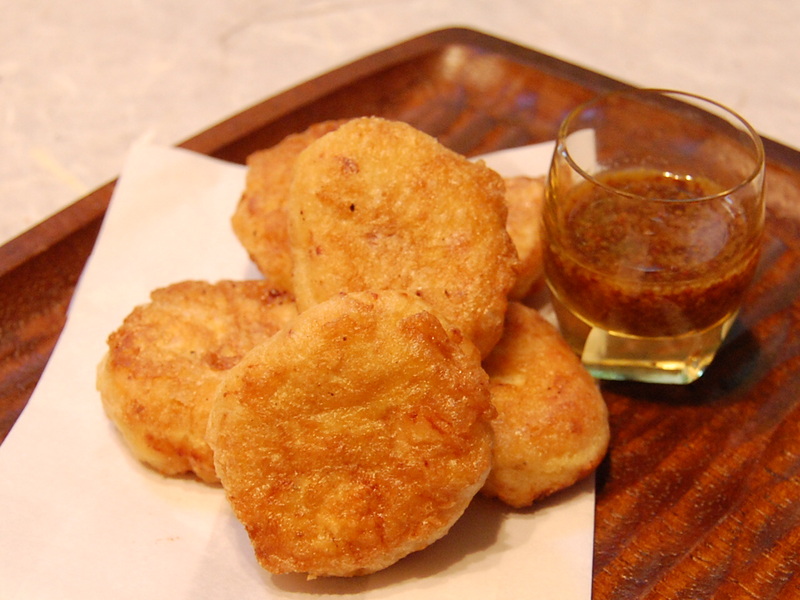 Enjoy the chicken nuggets while they are still hot with honey Dijon dipping sauce!